This is the fifth article in a series on the MINERνA neutrino experiment. Scientists from two institutions in Peru who are working on the MINERvA neutrino experiment may be far from home, but they are finding no major language barrier. "The language spoken by physicists is Physics," says Alberto Gago, of Pontificia Universidad Catolica del Peru. "Speaking good physics is more important than whether we are speaking English or Spanish. We all understand physics." The group of six scientists and students, from Universidad Nacional de Ingenieria and Pontificia Universidad Catolica del Peru, has the specific assignment of developing software for simulations and Monte Carlo event generators. But their actual work is far broader in scope. 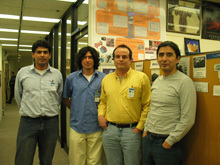 "We're working on almost every aspect of the experiment," says Javier Solano, of Universidad Nacional de Ingenieria. "We will know how everything comes together, and that is very good knowledge for small institutions like ours." Their vision for their work also extends beyond the experiment, to the growth of the physics and science communities in Peru. "We want to get a 'critical mass' of students coming to Fermilab," says Gago. "We hope to grow the participation in physics, and, especially, neutrino physics, which is an essential issue in particle physics,. . .We know that basic science is very important. We are a developing country, and we see that the big powers always invest in the basic sciences for their development." The two students currently working at Fermilab, Leonidas Aliaga and Jos� Luis Bazo of Universidad Catolica, are staying onsite at "MINERvA House," a farmhouse in the Village which has been adopted for long-term stays by collaborators. "This is an important step in our careers," says Bazo. "Learning this experiment from the beginning, taking part in the hardware production, is good for us and good for others who will come here after us." 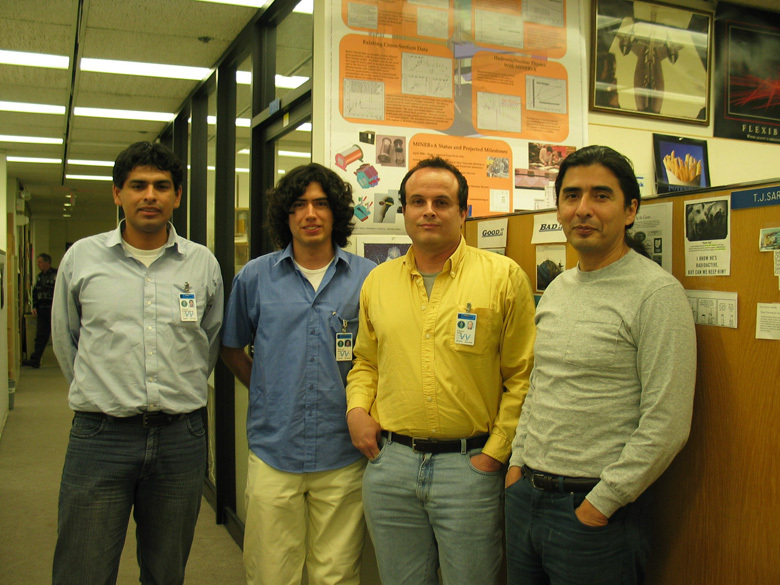 The participation of Universidad Nacional and Universidad Catolica extends a Fermilab tradition of encouraging science in Latin America, reaching back to the directorship days of Leon Lederman. This connection was facilitated by MINERvA cospokesman Jorg� Morfin, and formalized through a Memorandum of Understanding with CONCYTEC (Consejo Nacional de Ciencia Y Tecnolog�a), the Peruvian National Council of Science and Technology. Far Out, Man. But Is It Quantum Physics? Can physics save your soul? Two years ago, a movie with the unpronounceable title "What the #$!%* Do We Know!?" became an underground new-age phenomenon, raking in $11 million out of midnight screenings and word of mouth, spawning an industry of books, tote bags, clothing, DVD's and "biofield" jewelry. It purported to argue, based on the insights of modern quantum physics, that reality is just a mental construct that we can rearrange and improve, if we are enlightened or determined enough. Science and spirituality have tied the knot, and the world is your infinitely deformable apple. This winter an expanded version, "What the Bleep, Down the Rabbit Hole," began to play to audiences who say that the movie confirms what they already thought about the cosmos, some vibe they had that it is a slippery, woo-woo-woo kind of place. The movie just finished a two-month run in New York and is to be shown in May at the Quest for Global Healing Conference, in Ubud, Bali, with luminaries like Walter Cronkite and Desmond Tutu attending. Like its predecessor, this film features a coterie of talking heads: physicists with real Ph.D.'s, biologists, philosophers and a woman who claims to be channeling a 35,000-year-old spirit warrior from Atlantis. It tells the story of a sourpuss photographer played by Marlee Matlin who learns to love herself and take a chance on life. The Computing Division is presently holding some 92,000 magnetic tapes in an offsite storage facility in Chicago. Most of these are old 9-track raw data tapes from circa 1990, which were accepted into the tape vault system before 1993. No one can recall a request for any of these since they were shipped offsite about 10 years ago. The 9-track tapes can not be read by equipment at Fermilab, since we gave up the last 9-track tape drive 5 years ago. It's time to retire these tapes and save the cost of renting this storage space. We plan to remove them by April 15 when the storage lease is up for renewal. If there are any good reasons to keep some of these tapes we need to know now. Most of these tapes belong to experiments: E400, E594, E621, E653, E649, E665, E687, E683, E691, E706, E731, E733, E740/CDF Run-0, E744 E761, E770, E773, E791, and E799-I among others. A complete list can be found on the web and details of all the tapes in the tape vault system are also available. To the best of our understanding most of these are raw data for which data summary tapes and other copies exist in the Feynman Computing Center (FCC) and elsewhere. If there are good scientific reasons to keep some of these, we want to do that. On the other hand, this is some 50 tons (5 truck loads) of tape. We would prefer not to have to sort through it all before we ship it off to the shredder. We plan to keep all data presently in the FCC tape vault system for the indefinite future. More modern data; Run-II data for example, is mostly in robotic tape storage in FCC. It is relatively easy to copy these data to higher density robotic tapes as they become available when we upgrade the robots. We've contacted senior people from most of these experiments. Everyone who has responded agrees that there is no further need for their tapes. We need to hear from anyone who wants to keep any of these tapes. We'll start to act on our recycling plan soon. Anyone with concerns or questions should contact Peter Cooper x2629 or Tim Kasza x2695 . Hatha Yoga makes use of physical poses, breathing techniques, and meditation in order to bring the body in perfect health and for more subtle spiritual elements of the mind to emerge freely. The next 8-week session of Yoga will be March 21 through May 9. The class is held on Tuesdays in the ground floor auditorium from noon to 1 p.m. Recreation Membership is not required. The cost for the 8-week program is $80.00. A yoga mat is required. Beginners are welcome. The deadline to register is March 17. Registrations can be made in the Recreation Office or find more information at the recreation classes website. Registration for the Fermilab Summer Day Camp for children, ages 7 through 12 years, began March 1. Deadline to register is March 30. Entrance into the camp is made by lottery drawing on March 31. Camp sessions are: Session I: June 12 - June 30, Session II: July 3 - July 21, Session III: July 24 � August 11. The fee for each three-week session is $265.00. A $100.00 per child/per session deposit is required at the time of registration. More information regarding the camp and registration forms can be found in the Recreation Office, Housing Office, Users Office and on the recreation web page or call the Recreation Office at x5427 or x2548. Join in on the fun at the Kuhn Barn on Thursday evenings from 6-7 p.m. Learn the newest Country Line Dances (and some oldies!). Both beginners and intermediate levels are welcome. You don't need a partner, but if you have one drag 'em along. The six-week session is $30.00. The class will be held March 16 though April 20. Employees, visitors, family members, retirees, on-site contractors, and friends are welcome. Registration can be made in the Recreation Office, by mail (the form can be found on the recreation web page) or by phone using a credit card. Deadline to register is today, March 15.
International Folk Dancing will meet Thursday, March 16, at Kuhn Barn on the Fermilab site. Dancing begins at 7:30 p.m. with teaching and children's dances earlier in the evening and request dancing later on. Newcomers are welcome and you do not need to come with a partner. Info at 630-584-0825 or 630-840-8194 or folkdance@fnal.gov.